Good luck with the shoalies Mack. Looks like we will be about two weeks behind you. Which river you headed to? I am nervous about the Bartrams, but at least it doesn't take too long to get down there if I need to make a return trip. Awesome! You are truly inspiring. I can not wait to take you out in pursuit of some elusive yet aggressive Guads! I hope to chase my dream of a similar bass slam. You have given me some great ideas. I hope you don't mind me sharing your story and progress thought your journey as well on my blog. Pat, I am super glad to have you on board for the last leg (I hope) of this journey. You are more than welcome to share. 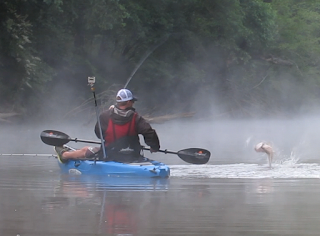 The more I plan this trip, the more I realize what a challenge it is - especially doing it solely on rivers. The logistics are tough and trying to figure it all out in essentially 8 days is even tougher. Thankfully, the river fishing community is (in my biased opinion) the best one out there and input from guys like you has helped me a ton. Well I will be sharing your story and posts. I have decided to go ahead and attempt my slam sometime soon. Hopefully next year...if I can find the funds for traveling. Thanks again. I am excited to hear that you are going do it as well. We actually wanted to go for the super-ridiculous slam at one point and throw in peacocks, hybrids, white bass, and striped bass, but time off and travel budget didn't allow it. Although, I will probably catch all of those this year other than a peacock. If you are headed toward NC at all, then definitely give me a shout! Drew, you're going to have a great time! I'm currently writing a book on and attempting the Bowfishing Slam consisting of 10 species that will take me throughout the country as well. Funny though, our starting points are roughly the same place, (my first leg was Belews Lake above Greensboro). Good luck and I look forward to following your exploits! Bill, that is awesome! I am very familiar with Belews Lake. In fact, there are quite a few posts on this blog that took place there. Best of luck with your slam! Good luck Drew! I'll be following along intently as this is something I would like to accomplish as well. If you ever pass through Louisiana (Baton Rouge) and need a place to crash, just let me know. All we have are northern strain LMB and kentucky spots down here - you'll likely pick those up back home. The redfish are where it's at down here anyway. Thanks Ben! If I make a trip down that way, you better believe I want go after some reds. We are actually taking a day to fish Mosquito Lagoon (FL) on this trip for reds, trout, and whatever happens to bite. You have given such an important information about this trip.Worked hard for it.It would be useful for all of us.